Here is a piece of good news for the candidates who are waiting for the TN MRB Nurse Hall Ticket 2019. The higher officials of the Tamil Nadu Medical Services Recruitment Board (TN MRB) had announced the Tamil Nadu MRB Exam Date as on 23rd June 2019. They had not yet mentioned the TN MRB Nurse Admit Card release date. It may be released in the month of May/ June 2019. So, check the entire page to get the latest information and the TN MRB Selection Process 2019, the exam date. Also, we have inserted the direct link to download it online from the official site. 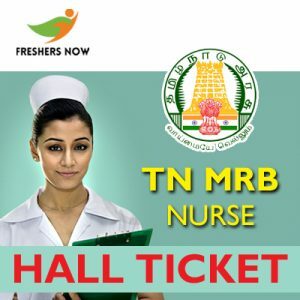 At the time of appearing to the TN MRB Examination, every candidate has to remember that they have to carry their mrb.tn.gov.in Nurse Hall Ticket 2019 along with them. Immediately after getting the TN MRB Nurse Admit Card candidates to have to crosscheck the details present in it about them is right or not. If not right bring it to the not to the notice of the higher officials of TN MRB. While going to the examination the main task of the aspirants is to carry their mrb.tn.gov.in Nurse Hall Ticket 2019 along with them without fail. If not the TN MRB organization members will not allow them to appear to the written test. In addition to that TN MRB Nurse Admit Card competitors have to carry anyone document from the below provided list for the verification process. Tamil Nadu Medical Services Recruitment Board (TN MRB) had released a notification to fill the 2345 Nurse Posts. Candidates who are interested in working for Tamil Nadu Government Jobs can make use of this opportunity. Firstly candidates have to apply for the TN MRB Recruitment using the application form. If the candidate reaches the basic requirements of the TN MRB board then they will get the TN MRB Hall Ticket 2019 from the official site of Tamil Nadu MRB. After getting the Hall Ticket candidates can know about the selection process. It is done as follows. After applying to the TN MRB Nurse Recruitment 2019, candidates have to download their mrb.tn.gov.in Nurse Hall Ticket 2019. We had noticed that many of them are searching for various websites on the internet to download the TN MRB Nurse Admit Card. Tamil Nadu Medical Services Recruitment Board (TN MRB). The official website of the TN MRB is www.mrb.tn.gov.in. Then you will get the home page of the TN MRB on the main screen. On that home page search for the TN MRB Nurse Admit Card link. Fill the details present on it. Recheck the information you had provided is correct or not. There you will get the mrb.tn.gov.in Nurse Hall Ticket 2019 on a new page. Download that TN MRB Nurse Admit Card in the prescribed format to your pc. Take two to three copies of that Admit Card and carry them along with you till the end of the examination. Got all the details about the mrb.tn.gov.in Nurse Hall Ticket 2019? Thank you for staying with us. For knowing the TN MRB Hall Ticket 2019 release date keep in contact with us. So, that we will send you the updated information from our Freshers Now page.